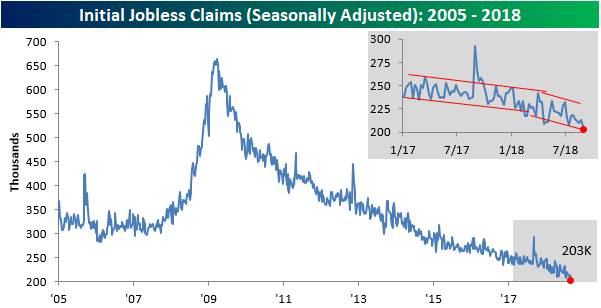 Jobless claims continued to amaze this week coming in at a level of 203K versus consensus expectations of 213K. 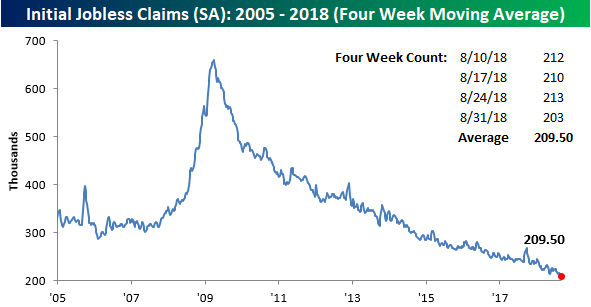 At this level, first time claims haven’t been lower since December 1969. 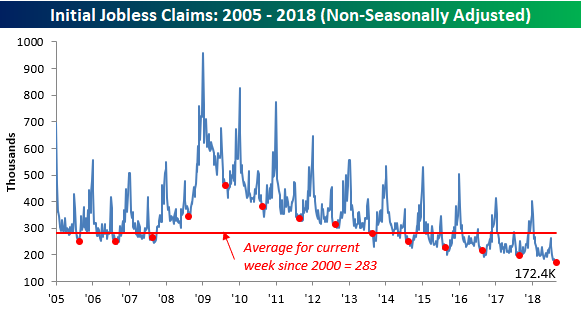 This week’s report also marks a record 183 straight weeks where claims have come in at or below 300K, the 48th straight week where claims have been at or below 250K (longest streak since January 1970), and the 9th straight week where claims have come in at or below 225K (longest streak since 1969). As shown in the chart below, we’re now coming extremely close to the point where we may have to adjust the Y-axis lower. With this week’s 203K print, the four-week moving average also posted a new cycle low of 209.5K- a level that hasn’t been seen since 1969. On a non-seasonally adjusted (NSA) basis, claims fell to 172.4K. That’s the lowest level for the current week of the year dating all the way back to 1969 and more than 100K below the average of 283.4K for the current week of the year dating back to 2000.